That’s not a joke: They’ve listed a number of groups whose members’ worst crime is disagreeing with Christianity and creating a safe space for atheists to discuss their doubts. We can only speculate which of our positions that we, as an organization, promote landed us on this map, but we’d like to at least raise an objection to the idea that we’re anti-Christian. We’re content to disagree on the existence of a god and the divinity of Jesus and leave it at that, instead choosing to work with people of all stripes and faiths to promote common values and causes: LGBT equality, elimination of racial inequality, wealth inequality, and even freedom of religious practice. That’s not anti-Christian, and there are some who say it even makes us more Christian than the AFA. 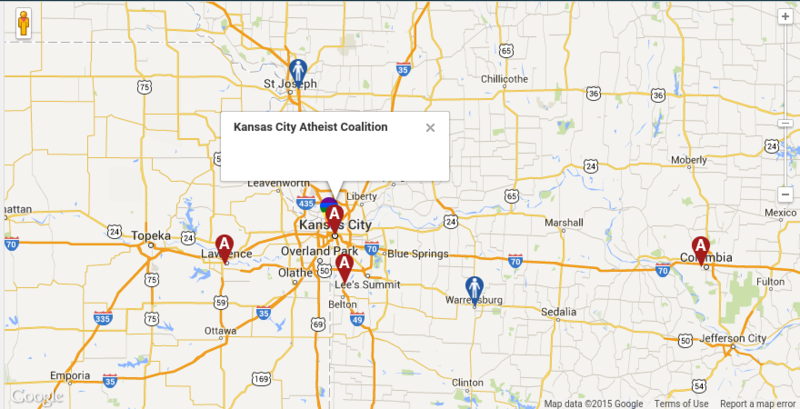 2 Comments to "American Family Association Maps “Bigotry” – Including KCAC"
Endorsements of an author’s body of work as representative of one’s values and views don’t get much stronger than proclaiming them educational material for one’s own children! And bigotry does not get much stronger than promoting the execution homosexual people for living honestly according to their born identities, or women for exercising their rightful autonomy over their bodies, for the sole reason that they aren’t abiding selected Mosaic Laws. Is not extremist religious fundamentalists enforcing archaic edicts from Middle Eastern desert-cults on everyone else, to the tune of executing people, EXACTLY what we’re supposed to be afraid of? That’s not just bigotry, it’s actual terrorism. No amount of tu quoque cries of “bigotry” against their critics changes that fact. NO rational American can’t afford to let voices this extreme and deranged be the loudest—and Christians in particular should seriously reconsider passively allow THAT level of vitriol represent them, unchallenged. Hello like minded Free Thinkers, non-judgemental Atheists. I appreciate the events flyer. Unfortunately I have 2 broken fingers on my left hand which would prevent me from Sorting Clothes. One of my Disabilities switched my sleep cycle, despite the heavy sleep meds my Neurologist has me on. I go to bed at 5:00 AM and get up at 1:00 PM. 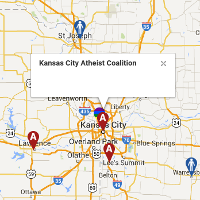 I was thrilled to learn about an Atheist Group in KC. I do have a question about the first sentence”……drives the perversion of Homosexuality back into the closet”. It sounds like Homosexuality is a “perversion”. I know Atheists are Pro LGBT, so that line confused me. I’m a Lesbian–Vegan–Atheist–who was arrested years ago for fighting for the treatment of all Sentient Beings. There’s no reason for Vivisection. Two years of Probation flew by. My PO only came to my house two times. I used to have a Private Practice on the Plaza before Disability. I wanted to introduce myself. I’m so proud of the work you all are doing to help and enlighten. Peace–Love–No More Made Up Wars ! !